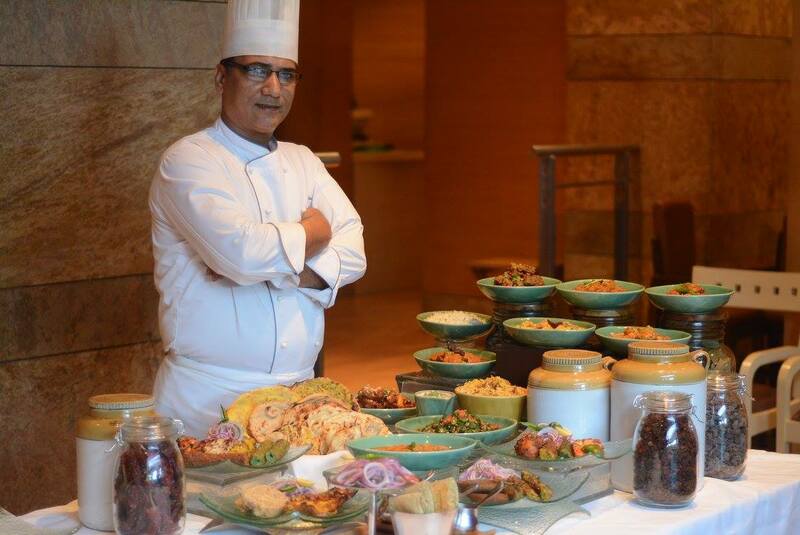 New Menu at Soma, Grand Hyatt Mumbai – Customized for Total Indulgence! This year, many of our favorite brands that have timeless prepositions have reinvented and so are our favourite restaurants. Clearly, ‘reinvention’ is the new trend. The Indian restaurant of Grand Hyatt Mumbai – Soma has deliciously rejigged their menu and I recently had the opportunity to host a Bloggers table. I invited 10 of my favorite Food Bloggers for the #StorySovietsBloggersMeet, to experience Soma’s new menu. 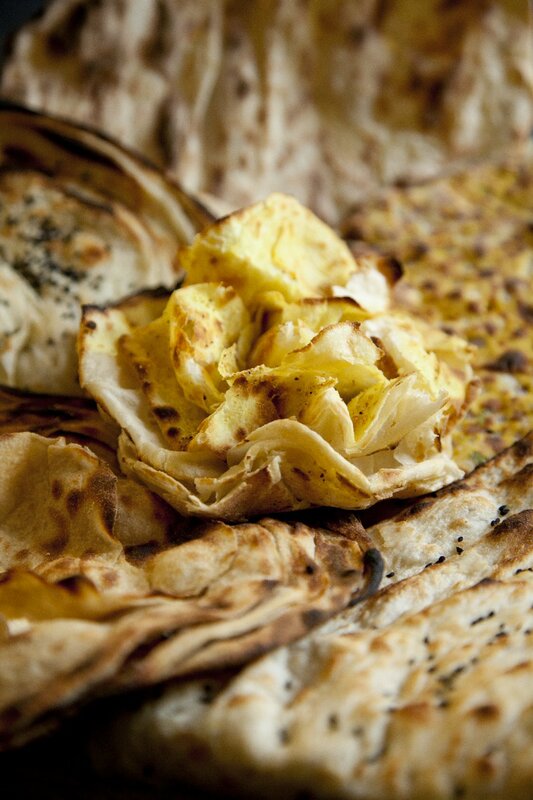 Soma offers authentic specialties from North India and the North-West frontier cuisine. The food at Soma is simple, with a selection of tandoor-grilled meats, seafood and vegetables, each prepared live to perfection. 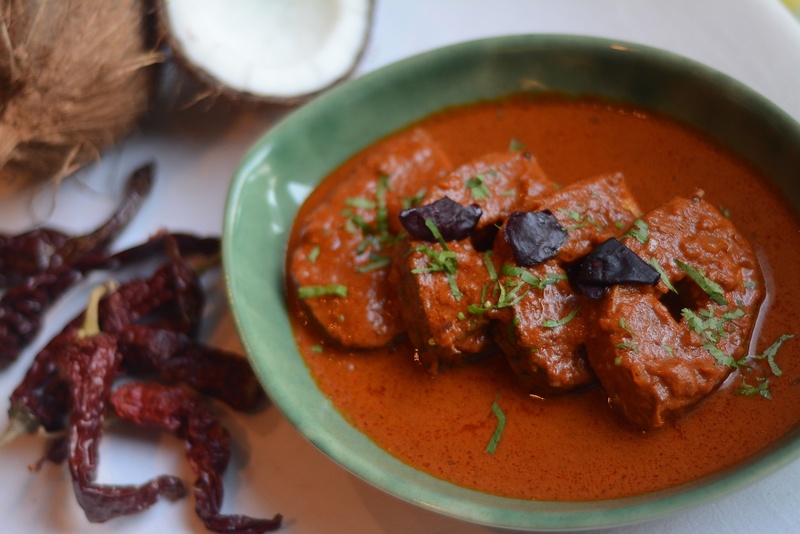 Taking this one step ahead, through the newly engineered menu, they’ve tried to break the myth that Indian food is only about North Indian food, and have included dishes across India. After a meet & greet at the bar, and some drinks, we proceeded towards Soma. What no one will miss the moment one enters Soma is the tandoor show-kitchen, allowing diners to see skilled chefs preparing the meal right before their eyes. The colorful and eclectic art reflects the moon in its serene traditional moods, providing the ideal ambiance for savoring authentic and traditional Indian cuisine. 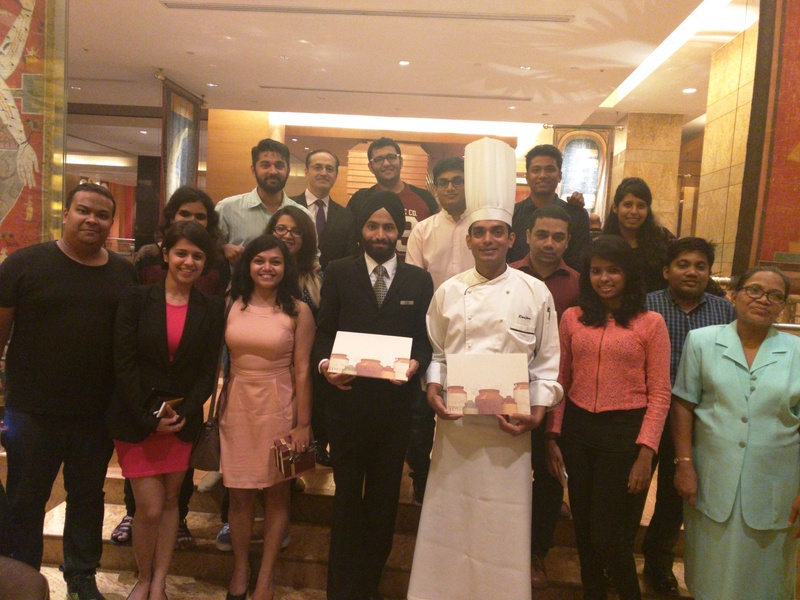 We were warmly welcomed by our host for the evening – Chef Varun Rana and his team. The passion and pride that the team showed about the new menu, got us even more excited. 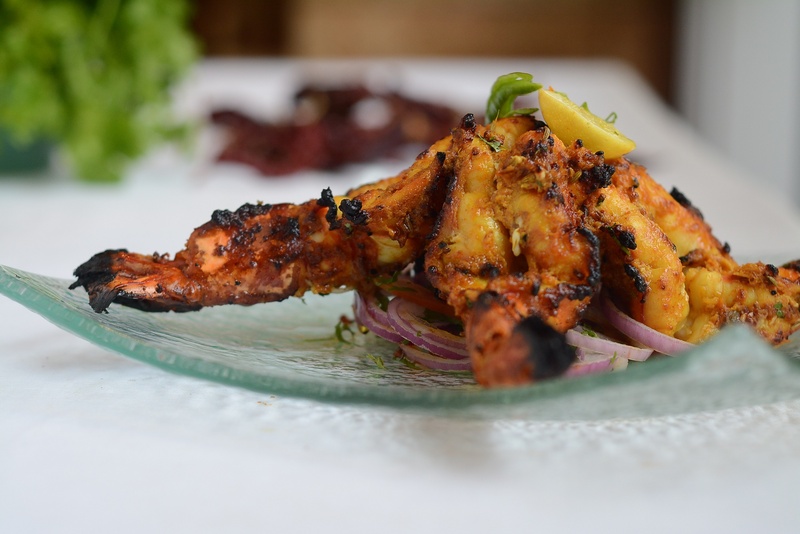 Immediately starting with our gastronomic journey, first dish on our table was the Achari Tandoori Jhinga – pickled marinated tiger prawns cooked in tandoor. The really well marinated and rightly cooked juicy prawns was a perfect start, for the seafood lover that I am. 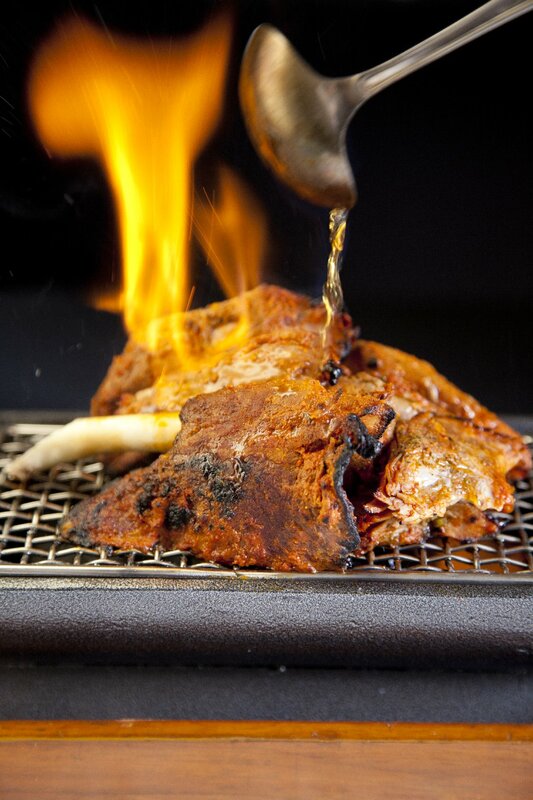 The next dish was the Raan-e-sikandari – Tandoor roasted leg of lamb marinated with traditional home-made spices. This was carved live at our table, after being flambeed with Rum. The super soft meat that just fell off the bone, made a not-too-lamb-crazy like me crave for more. Clearly one of the winners for me, from that evening! 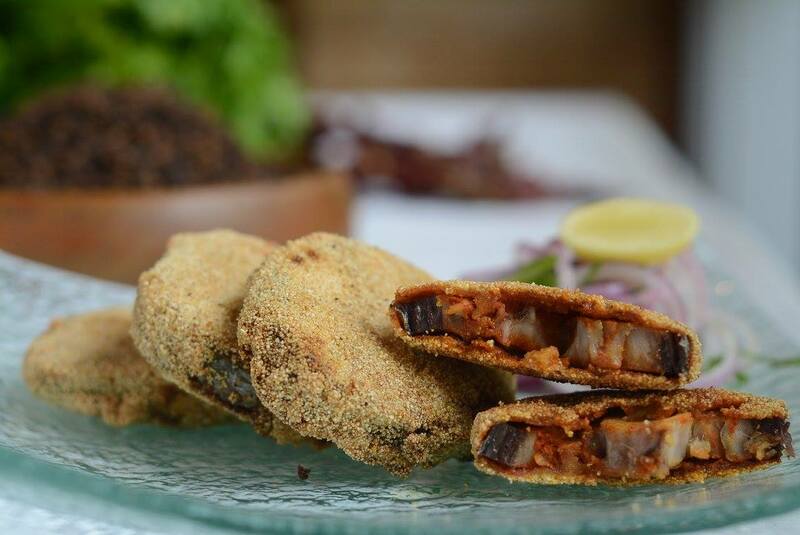 The next dish was the Rawa Fried Fish – Deep fried King fish coated with semolina and spices. This was under spiced and overcooked. As part of the appetizers, we then had Murgh Hariyali Seekh (Minced chicken skewer marinated with green herbs and spices), Tandoori Kumbh (Spicy mushrooms stuffed with potatoes and cheese cooked in tandoor) and Mutter hari mirch ki tikki (Deep fried green peas and chilli cake). 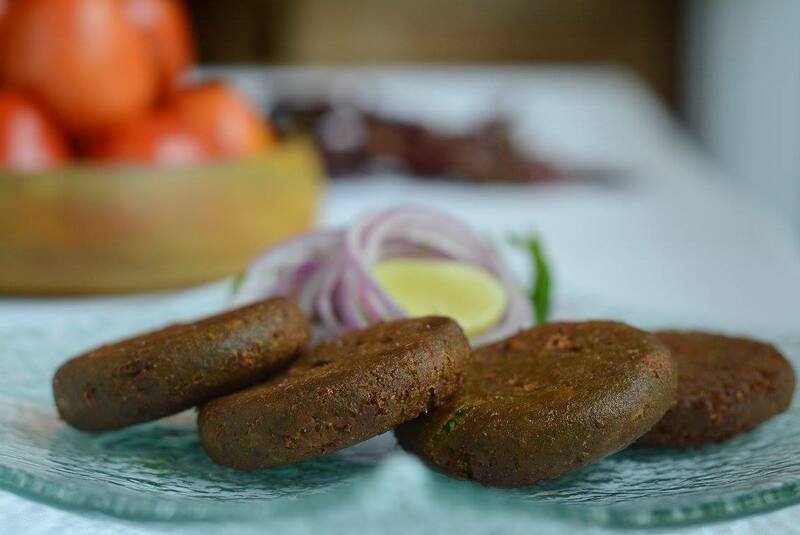 The highlight among these three dishes for me was definitely the Mutter hari mirch ki tikki – Chef Rana’s twist on the famous Hara Bhara Kebab, not too spicy and the peas gave the kebabs an awesome texture. 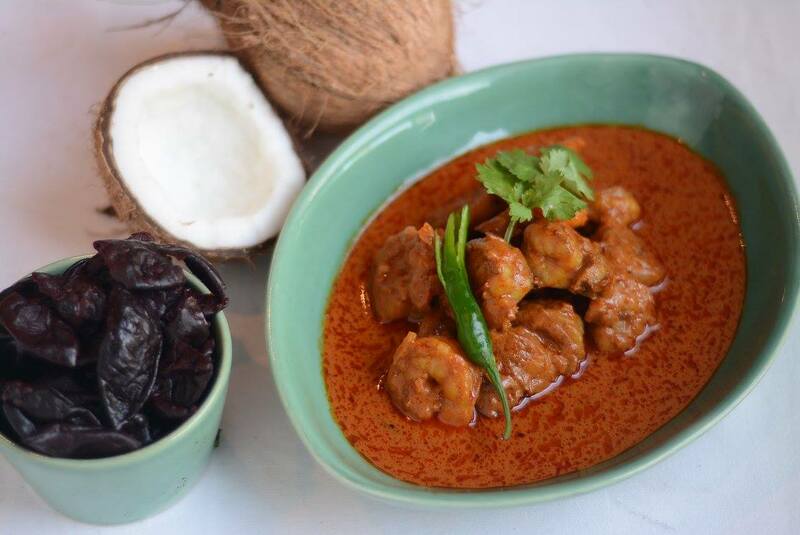 We started with the Malvani Prawn Curry. No, don’t go by the name. This wasn’t very spicy and the flavor was just right, with the prawns rightly cooked. Next we had the Sukha Mutton (Lamb cooked in Malvani spice, coconut and onion tomato) and Malwani komdi curry (Chicken cooked in coastal spices and coconut gravy). Out of the two, the Sukha Mutton was surprisingly (as mentioned earlier I’m a not-too-crazy-for-lamb) the winner for me. The succulent and super soft mutton coated with a spicy coconut mixture, was so beautifully marinated that it left me wanting for more. Soma’s new menu does not discriminate, and rightly so there was a variety of vegetarian dishes like Dum aloo Bhojpuri (Cheese stuffed baby potatoes cooked with creamy onion gravy), Ghar ki bhindi and Baingan Bharta. The Baingan Bharta is something that you shouldn’t miss, even if you’re a non-vegetarian. I think the Bharta was one of the best I have had in a long time. I was stuffed by now and wanted to be sure that I keep some place for the desserts. 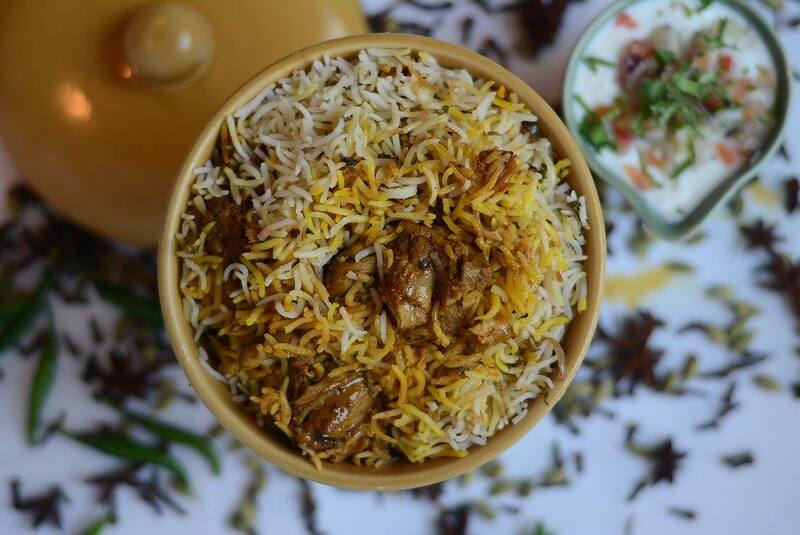 So I didn’t try the Subz Pulao and Murgh Dum Biryani, which according to other fellow bloggers was decent. Soon we were served our dessert platters, which was a total riot. A little cold, a little hot, a little different flavor and texture. 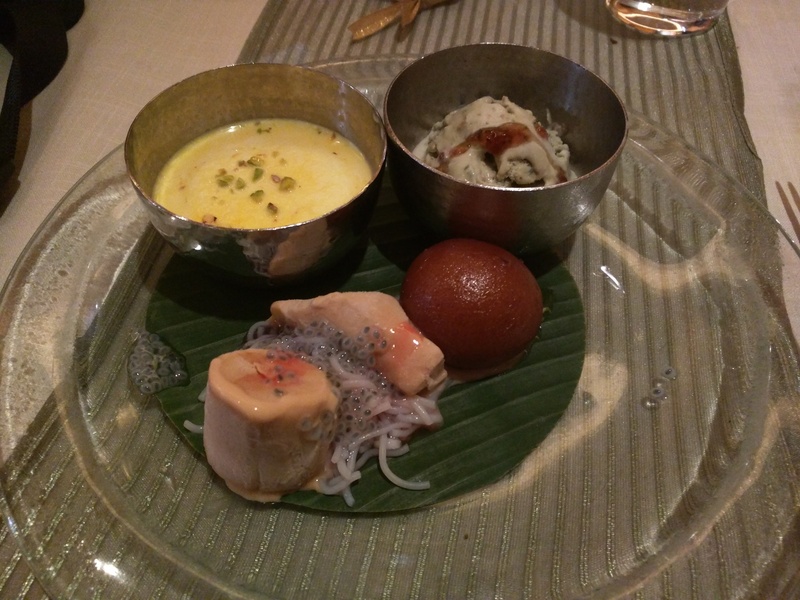 Our dessert platters consisted of Gulab Jamun, Kesari Rasmalai, Malai Kulfi and Paan ice-cream with Gulkhand. While the Gulab Jamun was soft and was served hot, I found it to be too sweet for my palette. The Rasmalai was soft and succulent with nice Kesari flavor, but was very runny. The highlight for me has to be the innovative Paan Ice-cream, and no one should leave Soma without ending their meals with this. All in all, be sure to enjoy the wholesome set menus starting INR 2450 onwards with vegetarian and non-vegetarian selections. 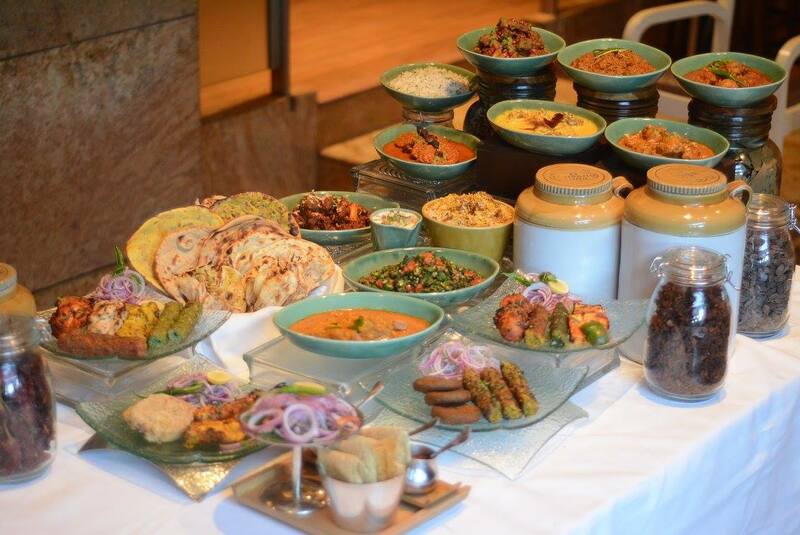 Indulge in a traditional feast of flavors with the Thali selections or order your favorite preparations from the a la carte menu. What more can a foodie ask for? Like-minded company and delicious food, in an ambiance surrounded by exquisite art installations depicting India in its unique manifestation. If you want to feel proud of the Indian cuisine or just want to indulge in a meal that will not only touch your heart but also your soul, Soma is the place to be. Adding on to the experience is the new menu which is customized for total indulgence! 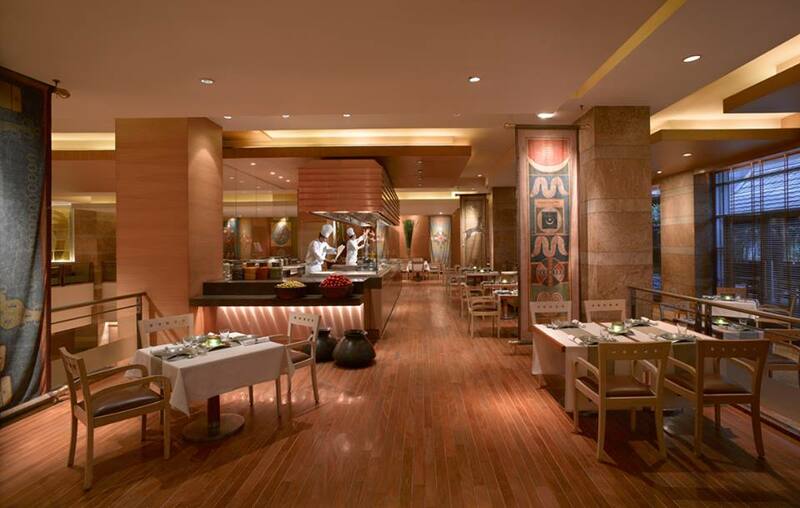 Soma operates for dinner and is located at the lobby level of Grand Hyatt Mumbai. For more details, please call at +91 22 66761234 or visit http://www.mumbai.grand.hyatt.com for reservations. New Dimsum Menu at Spices, JW Marriott Mumbai – Literally Touches Your Heart!